Whether you are acting as a caregiver or are a senior yourself, you know that routine activities pose a greater risk of injury than they once did, especially in the bathroom. The bathroom is already considered one of the most dangerous rooms in the house because of slippery surfaces, inadequate lighting, tight spaces and a lack of safety equipment, all of which prove to be huge safety hazards for the elderly and those with limited mobility. 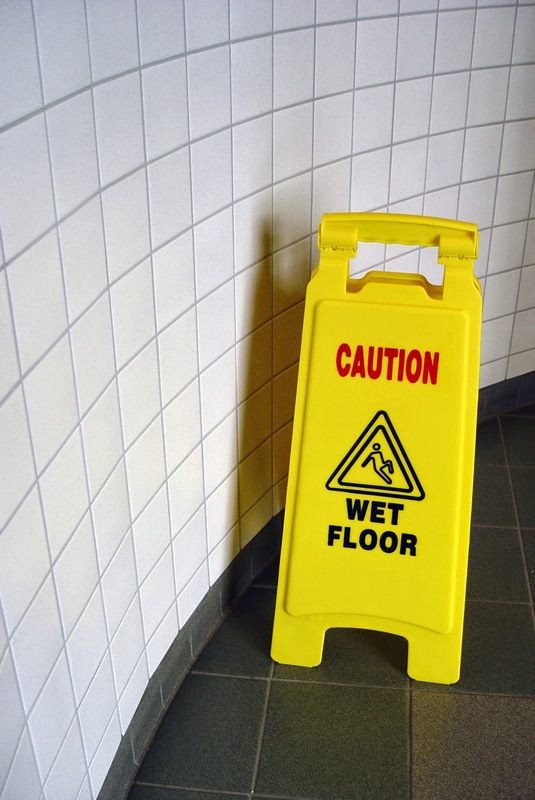 With some of these minor and affordable bathroom safety tips, you can help give everyone in your household a little peace of mind by preventing accidental slips and falls that could lead to serious injury. Especially for those that are more visually impaired, a poorly lit area poses a huge hazard when trying to steer around the various obstacles and uneven surfaces around the home and in the bathroom. Most seniors will find themselves getting up in the middle of the night to go to the bathroom, so it is important to illuminate a path to the bathroom for easy accessibility. Keeping a nightlight in the bathroom should ensure that there is always some kind of lighting present at all hours of the day to help prevent any trips over rugs and uneven surfaces, as well as allowing the elderly to navigate around the bathroom with more ease. In the absence of having something to hold onto climbing in and out of the shower, we often resort to leaning on towel racks and shower rods, which are hardly meant to support our weight. 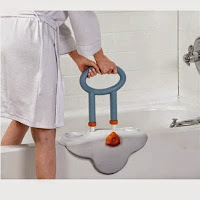 Grab bars and other bathroom aids for the elderly are specially designed to support a greater weight capacity, which allows for greater mobility around the bathroom and are especially useful in assisting the elderly in and out of the tub or shower. Grab bars come in a variety of different lengths and are easy to install in whatever position best suits the layout of the bathroom. 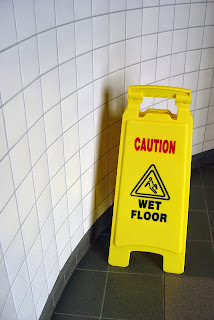 The floor and other surfaces in the bathroom are very susceptible to becoming slippery and can cause some nasty spills if they are not covered properly. Placing a non-skid mat both inside and outside of the shower/tub provides a dryer surface that should help alleviate some of the stresses about getting in and out of the shower. If a softer flooring option is preferred, rubber-backed bath rugs are cushy and absorbent, but they are also a tripping hazard, especially at nighttime, so consider installing carpeting throughout the bathroom to prevent accidents. Reaching for shampoos and soaps is likely to leave the elderly in an uncomfortable and unsteady position that can lead to a fall that could have been prevented if toiletries were located at a more convenient place. Wall mounted soap dispensers are affordable and easy to install at a height that is easy to operate. Great to use for body wash, shampoo and conditioner, wall mounted soap dispensers also negate the need to use hard-to-open bottles and containers that can be even more challenging when wet. Trying to reach for a showerhead in order to change the settings may also prove to be difficult, so installing a handheld showerhead is a great way to keep it accessible, especially for seniors who have shower chairs and transfer benches. Due to certain medications and medical conditions that may decrease the ability to feel heat, there is a risk of scalding or burns. If you are caring for a senior, take care to set the water thermostat to 120°F at the most to prevent any irritation and injury to the skin. The elderly have much thinner skin, making them much more susceptible to injuries caused by hot water. Even with the most basic bathroom activities, it is important to have someone nearby to count on in case of an emergency or just to make those routine tasks a little bit easier on an especially trying day. Whether a caregiver or a family member, it’s helpful to get assistance with things like getting in and out of the shower/tub, navigating the bathroom in the case of limited mobility, or even administering aid in the case of an accident. Double-sided locks are a great feature for added safety. The lock offers privacy for the senior but also allows entry from the outside, so the bathroom can be accessed in case of an emergency. With more and more seniors choosing to live independently for longer periods of time, it is important to take a couple of precautions to prevent falls that can result in mild and serious injuries. Whether you are planning an entire bathroom renovation or just making several of the affordable modifications listed above, rest assured that you are keeping yourself, or your loved ones, safe from potential accidents. How have you worked to keep your bathroom space safe from potentially harmful trips and spills? Share your own tips with us in the comments below, and be sure to browse our selection of bathroom aid and safety products at Preferred Health Choice! When a patient is bedridden, he or she must be rotated and turned in their bed every so often to avoid skin breakdown and bed sores. This can put pressure on a family member or caregiver, as they have to regularly rotate the patient themselves throughout the day and night. 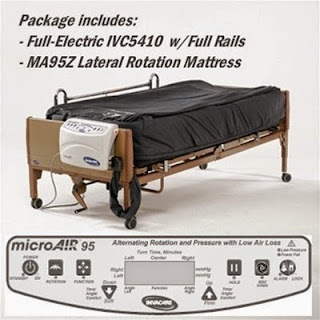 The Invacare full-electric hospital bed and MA95Z rotation mattress was created to eliminate a need for manual rotation by completing the rotations itself. Developed with the goal of ease and comfort, this lateral rotation bed and mattress is designed to make the patient rotation process as stress free as possible. Built with the patient’s best interest in mind, the electric bed has full length rails to ensure safety and stability when the bed rotates. The Micro Air mattress is one of the most efficient pressure reduction products on the market with its low air-loss therapy that keeps patients dry and free of any moisture. The overall design allows setup and use to be straightforward and easy. Operating capacity of 450 lbs. The Invacare MA95Z offers top-of-the-line care for every bedridden patient. By purchasing this full-electric bed and rotation mattress, manually adjusting every few hours is no longer necessary! Traditional hospital beds can leave patients feeling entrapped by bed rails that line the perimeter. 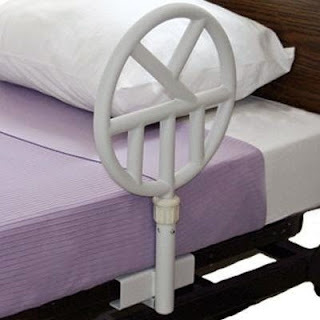 Most assisted living centers require that there be some form of a bedrail on a patient’s bed, when appropriate, making movement restriction almost unavoidable. With the decline of these traditional bed safety rails, new health technology is being developed to do the same job but take emphasis off of entrapment. The Halo Safety Ring eliminates the sense of being restricted to a bed while still providing the same level of security, and giving the patient more bed mobility. The circular shape is a modern take on the typical, rectangular bed rail. This allows patients to have greater mobility when they are in bed. The ring also provides the opportunity to be grasped at any angle. With multiple smaller bars within the circle, those using the product have the option to grab and firmly support themselves on both the interior and exterior. For an even more secure and comfortable grasp, Halo circle pad protectors are available to prevent slipping. The Halo shaped ring also has the ability to twist around to support those who are using it get out of bed. The Halo bed rail is available in two different models. The standard hospital bed model attaches to the bed frame and bed top surface, so it can be raised and lowered as the bed is adjusted. It can be purchased with a single ring on one side of the bed or with one on each side. The other model is for standard home beds, which can attach to any standard bed frame, has two rings, one on each side of the bed, and includes its own floor stands to provide superior support. The Halo Safety Ring is the perfect alternative to a typical bed rail and ensures the security and stability of anyone who uses it. Experience this modern medical innovation today!